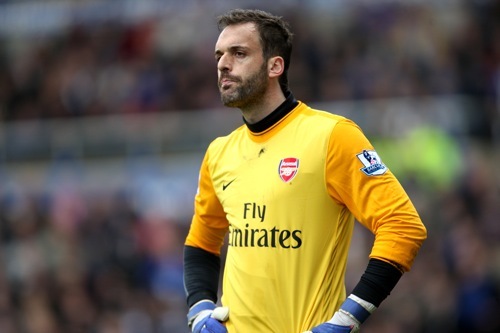 How do you solve a problem like Almunia? The Gunners have had a rollercoaster season, veering between the sublime and sub-par with astonishing frequency. At the end of the ride, though, there was no silverware. Goalkeeping was the major problem area throughout Arsenal’s most recent campaign. Manuel Almunia had a poor season. Lukasz Fabianski may yet be a good goalkeeper, as Arsene Wenger seems to believe, but his flappy performances emphatically state otherwise. A decent keeper is essential to ensure the continued success of the Arsenal Experiment. The dream choices would be either Igor Akinfeev or Hugo Lloris. Lyon will not relinquish Lloris without a large transfer fee, so Akinfeev may be the more realistic option. Arsenal are believed to be in talks again with CSKA Moscow after a fee was agreed earlier this year. At 24, Akinfeev has experience beyond his years, time on his side, and would suit Arsenal down to the ground. Defensively, Arsenal don’t need an overhaul. William Gallas and Vermaelen were assured when paired together, Bacary Sagna and Emmanuel Eboue were solid enough and whilst Gael Clichy suffered an appalling patch of form, he regained his composure in the last third of the season. If Arsenal do need anything at the back it is cover. Caught short due to injuries, Wenger was often forced to field either a midfielder in defence (Alex Song) or a predictably poor Mikael Silvestre. Arsenal fans will be glad to see the former Man Utd man’s contract end. Sol Campbell’s renaissance was a welcome surprise. Two more words: Kieran Gibbs. The talented young left-back should return early next season. What Arsenal do in the summer depends on what they are willing to spend. A tailormade player has been cultivated in Germany, where Neven Subotic has been garnering alot of praise for his performances over the last two years. However, Borussia Dortmund appear to be in no rush to let him go, except for an inflated fee. If Arsenal cannot land Subotic they may be forced to look within the Premier League for cover. Bolton’s Gary Cahill or Fulham’s Brede Hangeland may be lured with the promise of Champions League football in 2010-11, if not regular first-team football. In midfield is where Arsenal are strongest, but – ironically – weakest physically. With talent such as skipper Cesc Fabregas (he’s not off to Barcelona just yet), Samir Nasri, Aaron Ramsey, Andrey Arshavin (who, worryingly, seemed to lose interest as the season wore on), Denilson and the greatly improved Song, Arsenal should be envied. A box-to-box midfielder would be nice though – Arsenal have both creators and destroyers but do not possess someone with the ability to do both. Someone like Michael Essien or the Patrick Vieira of a decade ago would be perfect. The players who could fill this role include Barcelona’s Yaya Toure, who has fallen out of favour somewhat at the Camp Nou. Failing this, the Gunners might attempt to land Inter’s Sulley Muntari or Aston Villa workhorse James Milner, the latter’s versatility being a valuable asset for a Champions League team. Departures may include Tomas Rosicky, whose poor performances in the tail-end of the season have not helped his cause. The ever-promising Abou Diaby will remain but this may well be his last season if his patchy form does not show some consistency. Up front, Arsenal are also well-stocked with young talent. Wenger prefers a lone front man with support from midfield and wingers. Robin van Persie fits this bill, so the Dutchman’s fitness next season is crucial – again. In his absence the lamentable/exciting Nicklas Bendtner will fill in – the Dane had his moments this season and his confidence continues to soar; he is a clutch player, for sure. The quick-footed Marouane Chamakh (pictured) will be a welcome addition from Bordeaux, and an upgrade on poor Eduardo, who has regressed since that tackle. Even without RVP for much of the campaign, Arsenal still finished in the Champions League places. If they can retain their key personnel, avoid long-term injures and secure a top-class keeper like Akinfeev, they can once again be considered title contenders. Clutch is usually used in an american context. It means coming through in a (hate to be clichéd) clinch. Scoring when you absolutely, positively have to whether it be by sublime skill or dumb luck. It has to be said Bendtner scored some important late goals this season. Akinfeev would be an EPIC signing, and just what the Gunners need. A mean machine in midfield would be a great addition too. If Gallas is off, then another defender of the same calibre as Vermaelen is imperative. If these areas can be sorted then truly Arsenal can compete for the title once again! You seem to forget that Djourou will be back as cover (maybe even a first teamer!) next year at the centre half position. Yaya Toure in Arsenal??? There is no way to anybody score!!! If Yaya and Neven Subotic come to Aresnal, they dont need goalkeeper!!! I watch a lot of German football (only one besides EPL that doesnt make me want to puke from the constant diving) and you are right Subotic is tailor made for Arsenal. Arshavin kept saying all year that they are too short and are getting eaten on set pieces on both ends. Subotic is young (ahead of Vidic at the same age, its been said on broadcasts), tall with a nasty streak, excellent in the air which should help defensively but he also scores on set pieces and corners as well. He is definitely ready for the manly play of the EPL and will relish the physical challenges. Borussia has been making noises about 20million this week. A course on good manners would do Arshavin a heap of good. Teach him NOT to stick his tongue out when he scores, it’s very offensive and disrespectful.